Uncle Chris and Aunt Carrie had to leave this morning to head back to Dallas. We enjoyed getting to spend time with them. 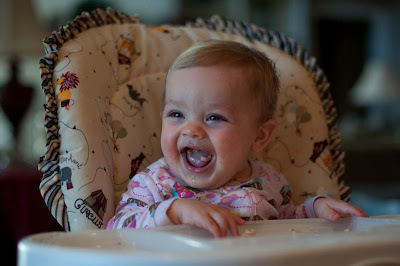 Harper was in such a good mood this morning as she ate her breakfast. Then it was bath time and nap time. Harper LOVES her bath. She likes to splash and play with bath toys. I think she would stay in the bath all day if I would let her. Baths got so much easier once she could sit up in the big tub. She has been doing that since August when we went to the beach. This afternoon we went and ate at Chili's with my parents and then came home and hung out for a while. 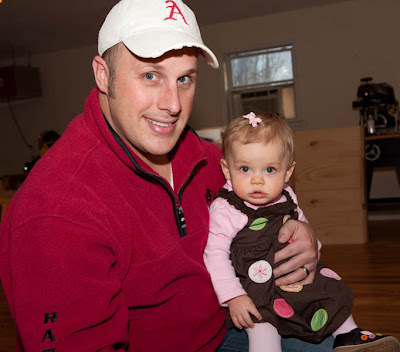 Harper just loves spending time with her daddy. Tonight my dad performed a wedding for his secretary (Jacquie)'s son Kale. Scott kept Harper so I could go. I felt VERY old during the wedding because I babysat Kale and his brother Tyler when they were babies. I used to change his diaper! ha! It was a very nice wedding. Unfortunately I didn't take any pictures. Now we are home eating pizza and cheering on the HOGS! Sorry Louisiana readers but the team I love to beat the most is LSU. So hopefully I can update later with a WIN! Harper was wearing her game shirt tonight! (yes - we lost our SECOND horrible loss this year. Does anyone know ANYONE who can kick???) I'm too sad to speak about it. On another subject - last night we worked to get Skype set up on all of our computers. Do you Skype? We are SO excited about it. When we went to El Salvador - pretty much everyone would talk to their families each night and I thought it was so cool! And it's free when you go between computers. So now Harper's grandparents can see and talk to her live!! Harper just keeps getting cuter every day! skype will be awesome!!! you will love it! We LOVE Skype! Our best friends went to South Asia to do mission work 2 years ago and it was so nice to use Skype to be able to see them and talk to them. They are coming home this Christmas!!! So cool! I love to see pictures of Harper she is growing so much and getting prettier and prettier each day! 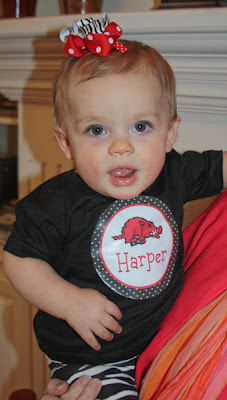 Love Harper's Razorback shirt!!! That is funny my son's name is Kale, there is only one other Kale I know. Glad you had a great holiday with your family!! Harper is just so cute! I love reading and seeing what she is up to! I have boy/girl twins that were born on the 12th of Jan, just a few short days before Harper! I started reading your blog while sitting in a hotel room, as my two babies were in the NICU. I can remember reading your story knowing that I had already been though that first few days and you were just starting those tough days.I cried and prayed for you that night so, knowing the pain you were going through. My kids are not doing things as fast as Harper(they will catch up), but are doing great and have no problems from their rough start at life. I just thought I would share, may God continue to bless you and your beautiful family! We absolutely love skype. We have been stationed overseas for four years now and it's the easiest way to talk to our family back home. Both sets of grandparents saw their grandson for the first time on skype and now they love to watch him play while we talk to them on the phone. Buy a skype phone instead of talking over the computer. The phone makes life so much easier! Yes, we love Skype! We actually set it up at my cousin's wedding last night so that my grandfather could watch from his nursing home bed in Alabama! He thought it was so cool to see his grand-daughter get married on "tv!" Cute new pictures! Skype has been a lifesafer for my 20 months old daughter since we live in CA and her grandparents are in the midwest. We skype several times a week. And, try having Harper skype w/ one of her baby friends. I'm sure her smile and face will light up with joy to see another little one on the screen. Enjoy! It's the little things in life - and a free one - that make a difference to the ones we love that live far away! In that first picture of Harper she looks JUST like you! Too cute! Sorry your Hogs didn't pull it off, but glad that my LSU die-hard hubs won't be depressed tonight! I won't have to make him sleep on the couch! Ha! What a game:( Wore me out!!!! The pictures are so precious, thanks so much for sharing. So very "thankful" for all of your time there with your parents. I know they are enjoying every minute with all of you! Kelly, you will LOVE Skype. My husband travels a lot and my two little girls (ages 8 and 4) talk to him every night using Skype. He will even say bedtime prayers with them. We love it! Oh, love Harper's polka dot dress. Very cute. So that's who LSU was playing tonight! We actually ate dinner at Chili's and everyone was glued to the TV, but the only team I could make out was LSU. I hope you get a win! Harper is just darling. I agree that bath time is not only easier, but much more fun when they can sit up. If you ever get a picture of a bath mohawk, we'd love to see it! She'd be the cutest "punk" around! Know how you feel about the loss...UK lost in overtime to TN...they were so close..would have been the first time in 24 yrs to have a W! I did catch the last few minutes of AK game! Harper is getting cuter by the day...and looking very big and girly! I do skype with my son and daughter inlaw that live in Argentina... nothing makes me happier to turn on skype and see that they are on. Skype is amazing - my parents get to see Jemima growing up from the UK - so cool! We starting using Skype this summer w/ Josh's parents. It's great that they get to see him and Brody likes that he can see himself while he talks to them! Ha! Hi Ms. Kelly! I've been reading your blog for almost a year now, but I don't think I've commented before. Harper is beautiful, and she's getting so big! And I wanted to let you know that you've been really inspiring for me, especially when it comes to faith. I've never been to church before, but I'm going to visit one tomorrow! Also, I LOVE Skype! Perfect way to keep in touch with all my friends who are at school in Tennessee. Skype is great!!! My family uses it and my fiance's family uses it all the time. I recently just used it because my family all got together for a big supper and as I'm on the other side of the country I couldn't be there--but we connected through Skype and it was almost like I was there! Skype is fantastic! My little sister spent a semester in Spain with her new husband and that is when we discovered the wonder that is Skype:). Since then, my husband and I have moved across the country numerous times as an Army family. We love it for keeping in touch with our families and even our Army friends! This past summer my sisters, mom, and I conducted Beth Moore's Believing God study all via Skype! They all live in Houston and I live in Fort Campbell, KY. But with jobs, children, etc...we were able to meet up on the computer after the children were asleep. It's a great tool. we are sick about the game, too! LOVE Skype! My parents in Texas get to see my kids anytime. It's fabulous! Kelly, we love Skype! My parents live 7 hours away in Memphis and they love being able to see their grandson on Skype! I know you guys will enjoy it and your parents will love seeing little Harper too! I LOVE skype!! Harper's dress is SO cute..looks like little sand dollars? Cute cute! We love skype!! It's so nice to be able to keep up with all of our family who are spread out across the country. Harper is as cute as always!! sorry kelly, but I love some LSU and I was pretty excited about that game :) all honesty it was a good game, LSU has been making me way too nervous this year! And Miss Harper is too precious, I love watching her grow up :) And my son Drew (21 months) loves bath time, its his favorite! I know you and your family have iPhones so this will be awesome for you, there is an application for the iPhone that you can download (it's free) so you can skype off your phone! As long as who ever you are calling has skype also! All my family live in the Uk and it's by far the best way I can talk to them all. When we wanna see each other we just video chat! Love the pics of Harper, she's just adorable. Skype was a life-saver for me when I taught overseas in Beijing a couple of years ago. I got engaged while over there and it was so fun to be able to show off my ring through skype! It was also the cheapest way to make calls to a landline (if the person didn't have the internet and/or their laptop handy). I don't use it as much, but man, I sure loved it while being overseas. Made the distance almost obsolete!!! Sorry about the loss but over here in Boise, Id we are still unbeaten and will be WAC champions after next weeks game (yes we will win next week because New Mexico state is 1-11 so far....) Have a good rest of your trip! we just got a camera for our computer as a gift, so we'll be working on getting skype sometime during the holidays! so exciting. Kelly you crack me up. I LOVE that you put Harper in her little razorback t shirt. You're spreading the southern way out here in Los Angeles. If only UCLA had a good football team..! Harper is just too stinkin' cute! Yes, we Skype. My cousin from Texas set it up for us. Last week when my daughter had our newest grandson, and my handicapped parents couldn't be there for the birth, we used Skype. As soon as we saw the baby in the nursery, I turned on my laptop and they got to see him getting cleaned up, and again in her room when they brought him in for the first time. It was special- the next best thing to being there. Skype is amazing! We use it all the time. We live in the Dallas area and almost all of our family is in Mississippi, so we are very thankful for it! Harper looks precious in all the pictures! Dr. M-R set me up on skype about 3 years ago when he went to Australia so he could keep in touch. I've used it a handful of times...so futuristic! When we switch out computers this week will test it out with you. The dress that Harper is wearing...my favorite thus far! TOO CUTE :) Hope you had a lovely holiday weekend, Kelly! If any of your followers would like a blog makeover for the holidays, I would love to work with all of them! Skype is a blessing for military families. Daddy is currently deployed but my boys can talk to him and see him everyday with Skype. Thank God for modern day technology! ps. Gator here, but will root for any SEC team as long as they aren't playing us! I love skype. so easy and simple to use and way cheaper than long distance. my sister lives in Alberta and I'm in Ontario it's nice to talk to her and see her! So sorry about Arkansas- seems everyone is having kicking issues this year. Hope you had a happy Thanksgiving. Hi Kelly, I read every day, but don't comment often, but I have to tell you the pug post the other day was ADORABLE. My 12 yo loves pugs, she loved it! Tara (above said 12 yo) loved her bath time too. 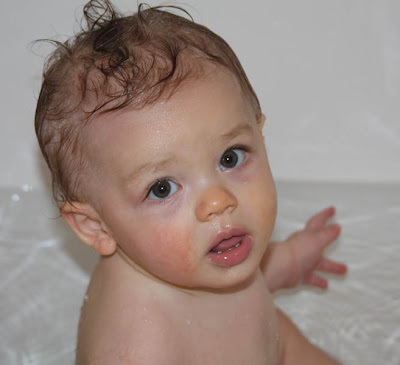 As a single full time working mom, I loved bath time. Once she was old enough to not need total supervision, I could run her a bath, she would play "forever" and I could sit at my desk or even watch TV and still keep on eye on her (master bath/master bedroom situation). Those were my down moments. She STILL loves to take baths! Tara uses Skype much more than I, she chats with friends from far away, many that she has met on line. The internet really has made the world smaller! GEAUX TIGERS!! Good game for your Hogs, but the Tigers pulled it off!! The first picture of Harper is amazing! You can feel her excitement and hear her laughter!!! We were hoping for a HOGS win too! I love to see LSU lose almost as much as I like to see Auburn lose!!!!! Almost! I loved watching the ridiculously shocked look on Miles' face when they lost to Ole Miss last week! But I knew because of that loss, and Miles' looking like an idiot for losing it the way he did, that LSU would come hard this week. Now you've just gotta cheer for the SEC West team next week! ROOOOOLLLLLL TIDE!!! Love the pictures of Harper at breakfast! So precious! Her hair is getting thicker too! My Carlie was 13 month old before her hair started thickening and growing. Now, at 7, she has the thickest head of hair known to man!!! I feel your pain on the kicker - we (Tennessee) have lost two heart breakers as well. I was on pins and needles last night! So if you find that kicker, maybe you can find out if he has a brother who looks good in orange? I love reading your blog, but I have to admit...I bleed purple and gold! Geaux Tigers! Although, last night was a heart attack game for sure. I was there and was holding my breath the entire last 5 minutes. Love the pics of Harper! I have read your blog since you found out you were pregnant with Harper. I came across your link, loved how you incorporated photos, and HAD to follow you. Then Harper was born and I spent days at school on my blackberry checking your page frequently to see if you had posted any updates on how she was doing. Each time I read your posts, I prayed for you, Harper, Scott, and your family. 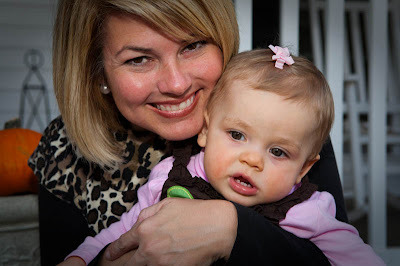 I can't imagine what it was like during those days because I had read through your whole blog about how you had been so patient in waiting on God to allow you to become a mother. I draw strength from you because you are always so uplifting and sweet. You also have a beautiful family! My very, very, very best friend joined the Marines, and he has been gone since May (with an exception of 2 weeks of leave after basic training). It's so hard to go day-to-day without seeing him! About a week ago, he got a Mac computer and set up a Skype account. I was thrilled because I also have a Mac (and Skype). Now, we shop online while talking on Skype, he shows me around his barracks, but the point of the matter is now I can see him! Even if he is in Virginia! So, Skype is a wonderful invention, and whomever you use it with will feel like they are actually right there with you! The only sad, bad, unfortunate thing about it is that whenever it's time to say "goodbye" you can't hug the person on the other side of the computer! Hahaha. Hey Kelly just to let u know my sister and I feel your pain with the overtime loss! We are big UK fans and of course we went to overtime AGAIN against UT and lost! We love to read your blog and when we got to our car and heard the other SEC scores I looked over at her and said " Kelly from Kellys Korner is sad tonight with us!" We cracked up but it did make us feel a little better. Maybe..
Glad you had a great holiday...thanks for making my day with the pics. 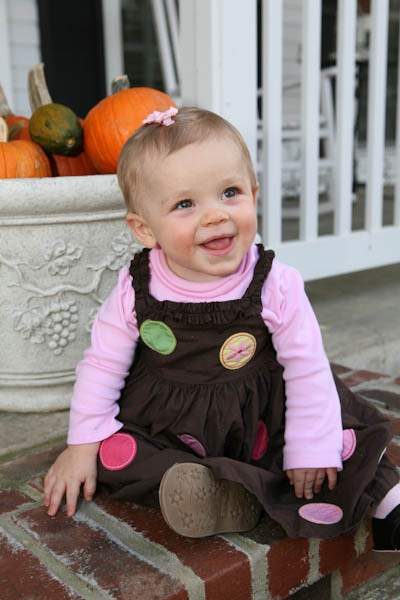 The love of my life, my sweet niece A, is 2 today. It pains me deeply that I am 1500 miles away from her today, but thankfully I'll see her in 456 hours (19 days)! Hoping to talk to her on the phone later today! Hi Kelly, where did you get Harper's adorable HOGS t-shirt? You must share!!!! Harper is so cute!! I love her little Razorback shirt & the zebra pants!!! I totally agree we really need a new kicker!!! I got really worried when it came down to a field goal for us to tie again...he is never good under pressure! It was a great game though! Now i am ready for a bowl game!!! We love Skype... We Skype my brother's sister in North Carolina and we feel like we see her more than when she lived much closer to us! We even got a tour of her new home using Skype! We tried to pull y'all through at our house! Seriously, we wanted Arkansas to win so badly! Same for the Kentucky game and TN ended up winning it in OT. Boo. But Roll Tide...we won the Iron Bowl! Glad you had a happy Thanksgiving. I'm glad you had such a wonderful Thanksgiving!! I love Harper's button dress and shoes!! Gotta "heart" Skype!! My family and I are all on Skype. I talk to my parents almost every night. The fun thing is my sister lives with my parents along with her 16 month daughter. They live over 500 miles away from me and came to visit over Thanksgiving and my niece knew who my husband and I were and I think that was because we see her on Skype on a regular basis! I also think you can get an app on you iphone for Skype too! Kelly- Skype is wonderful!!! Our son lives 5000 miles away from us--- seems like a world away, but when we get to see him on skype it helps. He is a youth pastor in Scotland and I have sent him your blog many times. Harper looks adorable in all her cute outfits and shoes. Thanksgiving is such a wonderful time of year to count our many blessings. Enjoy this first holiday Christmas with Harper. God bless. I echo everyone's love of Skype! We use it a lot for grandparents, friends overseas, and have even been able to conference up to 6 of my college roommates all over the world. It's one of my most favorite things. :) Glad you had a wonderful Thanksgiving! Hubs and I went to see the movie, The Blind Side, and afterwards, we ended up at a local restaurant. We were seated in the bar area and right across from a television. Of course, we live in Louisiana, but we are die-hard Bama fans so we don't like LSWho at all. Believe it or not, everyone that was sitting around us were Arkansas fans and we were pulling for ya'll, too. Our surrounding area in the restaurant went wild when Arkansas scored the last time. When OT started, we had to leave (it was getting late and we had a babysitter) but we listened to it on the radio on the way home. Tough loss and I was so saddened because I was SO hoping ya'll would win. Like I said, I can be a Hog Fan for a DAY ONLY!! Ha ha! That game stressed me out to the max! My husband is still fuming about it~! Skype is great! We use it to talk to my family in Indianapolis and we're are in NC. You guys will love it! Love that first picture of Harper eating her breakfast! I need to learn more about Skype...my kids miss their mo and grandad so that might be neat/fun for them?! I think Mario's cousin uses it when they are overseas to talk to their parents back home. It was SOO good to see you, only wish we had more time! We love ya'll! My son just put Skype on my PC, still need to get a webcam. Him, his wife and my grandson will be on the other side of Oregon from me this Christmas...so we are making plans to Skype. I also have a daughter who will be marrying a man who will be stationed in Hawaii...that breaks my heart...too far away...so Skype will hopefully be as great as people say it is. Otherwise I will be flying alot!!! love your blog, your faith, your wee one and your husband! Very fun to follow. You are a blessing to many! Skype (which I'd never heard of before my trip last summer) absolutely saved my life while I was separated from my husband and sons for over 2 months unexpectedly!! And I didn't even have a laptop with me- a generous friend who lived nearby lent me hers so I could keep up with my precious family...and now I'm hooked! I think you will love it, too! my husband travels a bunch and one of my very best friends moved miles and miles away, so we use skype all the time and LOVE, LOVE, LOVE it!! happy skyping!! and happy thanksgiving! i almost didn't recognize harper with that dinky little pink bow in her hair. sorry for the arkansas loss. who doesn't like to beat up on a little LSU?? as a VOL fan, i'll admit. it's always a happy day to see LSU (and florida) lose. thanks for sharing your holiday. harper is pretty adorable, and looks so cute sitting with her daddy. Harper is pretty much the cutest thing ever! My mom and I SKYPE every night. We are 4 hours away from each other and we would be lost without it. Last night I showed her all our Christmas decor. So fun!! I LOVE the "Jumble of Charms" necklace. I'm expecting my 3rd (and final) child and would love something with all three names on it. you have one cute little girl! Sorry- y'all need a kicker; we are SO in need of a quarterback! Totally an LSU fan and LA reader! But we won't hold it against each other right? I thought it was a very exciting game! Skype is fabulous!!!! Y'all will love it! We LOVE skype! I think this is the only way my parents have survived living so far away from Kinley! Ha! Your family will love it and so will Harper. She is such a doll!! Harper and Harrison have the same high chair! YEAH! :) It's the only high chair that has ever made sense to me. I love that when they fall asleep you can just lay it back. I love that it has a thingy between the legs so they don't slide down when they're little. I love that it has a washable cover. Okay, ENOUGH about the high chair huh? ha! I'm just catching up on your blog. So sorry but I was very happy with the LSU win!! :) But Harper did look *adorable* in her little Hogs outfit! Skype is one of our best friends. When we moved to Washington state to plant a new church last October we took our 1 year old baby boy away from all his grandparents and aunts and uncle and cousins. They weren't too excited about that and Skype has been our lifesaver. Plus, I was pregnant when we moved and had a new baby two months later that everyone wanted to see. That is how our families are watching my boys grow up. It is great! And I think my boys believe that their grandparents are movie stars on t.v. ha ha! this little 4 month old is in the hospital, and it doesn't look good. but God is good and prayer is amazing. please remember Makenzie in your prayers. where did you get that brown dress with the polka dots? it's the cutest dress! It would be so fun for grandchildren to communicate with their grandparents in this way!